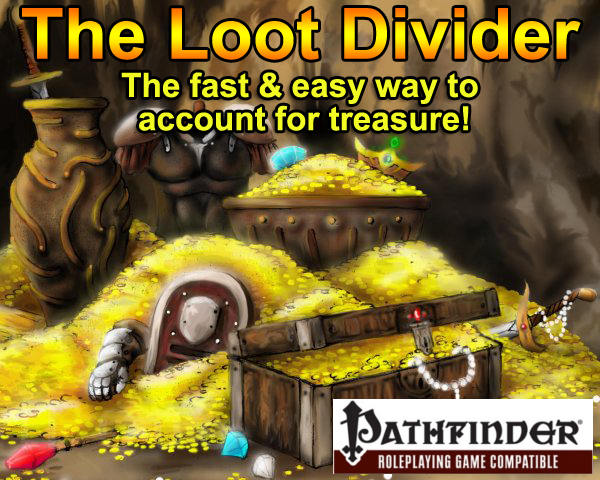 Compatible with Excel and Open Office, The Loot Divider is an Excel workbook that will facilitate Loot Sharing/Tracking for players of the Pathfinder Roleplaying Game and 3.5! Video: The Introduction to the Loot Divider video (http://www.youtube.com/watch?v=fwRtk0TdwCQ) focuses on the use of the Treasure! sheet. It also shows how easy it is to add magical properties! The Treasure! sheet is used to sell items (magical or otherwise) and split the loot equally. The Players' Loot sheet lets you track which players took which items, so that everyone can have a fair share. This can help avoid conflicts when more than one player wishes to get a particular Item. The Tracker sheet is similar in functionality to the Players' Loot sheet, but has less automation for those who do not have access to Excel Macros. It presents an alternative way to track treasure. It also features a Humanoid figure that can be used to show the locations of objects. The Group sheet will hold any items considered to be owned by the Group. The Item Builder sheet assists you in using the proper syntax for Arms & Armor with magical properties. The Loot Divider will simplify your work in dividing loot! Divide and conquer... Loot Divider Rules! The tool is amazingly easy to use and just as powerful as you would hope. And when you see the price you can't say it is expensive. It even get's updated! This is well worth the money. it deals with treasure very quickly and easily. Would have got 5 stars if it has a "Generic Treasure" sheet where you can enter gold, art, gems etc. and a summary sheet where you can see all the group + individual totals. That said; this halved the amount of time it takes me to work out treasure placement. It also has a killer "% loot" feature that enables you to see which player has what % of the overall loot - superb! I've just opened it up, and I love it already. No more having notes and scraps of paper to write everything down on, or dealing with a non-present player having the list of treasure. The GM or player can jot this down as needed on his laptop, and print out a copy at the end of the game. I don't use all of the loot divider. We don't worry about tracking who takes what, so I can't comment on that. But what I can comment on is the Treasure worksheet. AMAZING! its finally simple to track loot, and more importantly sell it! This has always taken massive amounts of effort before, with one player having to look up values and doing all the math. As a DM i hate having to trace the value for each item of gear my PCs loot from the dead corpses of their fallen foes. Getting one of the group to do so is equally unsavoury as it's a major turnoff for any gamer to have to spend half an hour or more tracking down what each item is worth. This tool eliminates a lot of the work that goes into divvying up the loot. It's the best tool for this that exists to my knowledge ... the only thing that'd make it better would be if Paizo authorised the addition of all custom items they create in their PF sources to the loot divider. Even without that though it's easy enough to add new items (might take some getting used to excell for those of us who aren't wizards with it) that this is not a big problem at all. Nice work, though i expected nothing less of the guy who brought us TOS+! You can view a Demo Video of the Loot Divider HERE. It focuses on the Treasure! sheet. This is a great tool for tracking a campaign's treasure, and the report output works well for both PHPBB PbP and for just a straight forward print out of what's found and what's been shared. I use it for all of my games and it makes it much easier for the players to maintain records of treasures found in the past, or when investigating a crime scene, a handy tool for collecting evidence. Can you change the value of standard items in the program? We value armour and cloaks of resistance at 50% more than standard, can the program adapt to this? You can create custom items, or just alter the values of the items in the Tables tab of the XLS. Then save the sheet. Viola. This sounds awesome! Would I be able to save different versions of it? Meaning if I alter it to fit another fantasy RPG's assumptions, will I be able to save a version for its pricing, etc... and still have a version of the data good for straight up PF RPG? Or should I buy a separate version of the program for each Fantasy RPG I like, then customize the data for each? Pen, paper and either a brain or a calculator is all you need! By the time you've fiddled around with this software you could have moved the campaign on by 2 or 3 encounters! Nice idea, but sorry I see no use for this item other than to slow down gametime. I just LOVE negative reviews from folks who haven't used the product! I'll be buying this today so I can check it out for myself. I can imagine it saving my group a lot of time. Agreed. I was basing my answer on the beta, as I didn't notice the inclusion of the rate column until later. Also, I don't need to have used it to know that I don't need it, as I have a brain and a piece of paper, oh and a pencil too! We don't use PC's of any kind at the game table, never have and never will, we're strictly a pen and paper gaming group. However I'm sure some will love this software and find it very useful. You can re-define this special character used for this in the Tables sheet." Your idea of a growing list of PC-assigned items is quite interesting - The Tracker sheet was not exactly designed to do it in the manner you are proposing. I'll check on adding an 'alternative' way of tracking items like you suggest - This would be slightly different from the Tracker sheet. Thanks for the idea! I will be opening two new sections on the forum for the Loot Divider: One for Bug reports, and one for Suggestions! On #2, you're absolutely correct, the instructions do clearly state that the value that's going to pop out of the $ function are going to be the same value you enter, so you need to enter the value you want for the sell value. It just seems to me the one encounters more "objects of worth" that are going to sell for the standard 50% than things that will sell for full price. Published adventures are full of little works of art, pieces of jewelry, and other items that will end up getting sold for 50%. ** I'm lazy (that's why I bought the automated loot divider :). I don't want to have to remember to cut all those prices in half when I enter them into the list. Personally, I'd rather just enter the given price in the $ function and have it do the 50% for me. And on those occasions (like coins) when you don't want 50%, you could use the Rate column to tell it 100%. I don't know, but I feel like there will be more 50% occasions than 100% occasions. Yes, I am quite open to suggestions and ideas. I've worked all day implementing the automation required for a new sheet [currently] called the Players' Loot; Basically, all players have one column, and you can select/insert entries from the Treasure! sheet in the column of the receiving player. The complexity of this resides in the fact that the Treasure! sheet can be erased at any time: If I would have used a simple "vlookup()" formula to 'fetch' the value of the Item, I would loose this values the moment the Treasure! sheet is erased!!! So I had to resort to programming to make this work: Once you have entered items in the Treasure!, you can select these Items in the Players' Loot: The Sheet will automatically grab the value off the Treasure! sheet and paste it (just the value) for that item! Now, even if you delete all the stuff from the Treasure! sheet, your values in the Players' Loot remain save. As a bonus, I also took into account the current sell rate that could have been set for that item, and apply it to the value. And if no custom sell rate was define, the code will use the default one. Also, the Scrolls have been added now - the one listed in the SRD (here). I'm not sure if Scroll costs changed from 3.5 -> PFRPG though. I'll post this new version on the Forum for the Beta Testers to play with and let me know if all is good, then I'll update it here on Paizo's page; They are supposed to send emails to customers when a product is updated, so you should get an email once it is. I'll post a message here once I post the update. Damn. That's what I call responsive customer service. The Loot Divider version 1.20 is currently in Beta testing! You can check out the release notes HERE. A preview of the new Sheet added (as per Mosaic's suggestion) called Players' Loot, is visible HERE. Going to go out on a limb here, but are you a) profiting off a pretty simple concept because most people are lazy or b) should all the folks who do the character builder spreadsheets need to start charging? I can't malign you for doing this, I'm just questioning the value, but if people are willing to pay, power to you. Seems like a good exchange to me! "The paizo.com Uploader is down for maintenance. Once this is resolved, I will make the update. It is my understanding that those who purchased it will be advised by email once this new update is available. It's not that I'm lazy, it's that time is valuable to me. I enjoy creating new characters but not worrying about whether or I've correctly added every bonus and subtracted every penalty from my character sheet. I enjoy finding treasure but not making sure that everyone gets his or her fair share. And what I really enjoy is playing. Sure, I can do all this stuff by hand, and it would only take 10-15 minutes, but those same 10-15 minutes could also be one more encounter. That, to me, is worth a couple of bucks. As far as charging for something like this goes, free stuff is cool. I use both PCGen and Eriane7's Excel sheet - both great and both free. But the Loot Divider offers a utility that nobody else offers. After spending almost an hour trying to figure out how to divy up the tresure from my last game, I'd happily spend $5 to get that hour back, or at least to not have to do it again. ut the Loot Divider offers a utility that nobody else offers. After spending almost an hour trying to figure out how to divy up the tresure from my last game, I'd happily spend $5 to get that hour back, or at least to not have to do it again. Not sure what that says, but there it is saying it.
. Sure, I can do all this stuff by hand, and it would only take 10-15 minutes, but those same 10-15 minutes could also be one more encounter. That, to me, is worth a couple of bucks. My answer is we rarely bother with loot at the table. We typically have one person who writes it down as we go, maybe makes a note or two if a piece goes to a party member, and then we settle details over email in between sessions. In the end my actually point was that the Character Sheet folks should charge, because frankly there efforts are much much greater and the audience demands for customization are constant and brutal. In any event huzzah capitalism, as I know I for one am a benefactor of its spoils. Hm, I just got the email notification regarding the updated Loot Divider, but when I redownloaded it, it was still v1.01. This happening to anyone else? I've verified that you *should* be getting version 1.20. Did you repersonalize it before you redownloaded it? Is is possible that there's something between us and you that's caching the old version of the file? Hmm. Found the problem. I fixed it for you, and Ross is going to fix it for everyone else in the next couple of minutes. I just repersonalized and downloaded the file, and it's v1.20 now. Thanks Vic! How strange. I just noticed that my 3-star review disappeared. Hmmm. Weird. RiTz12 even quotes parts of it above. I may have to go back and add it again just to keep the average rating correct. But to be fair, I've downloaded the new version and RiTz21 has already addressed one of my earlier concerns. Still, how strange. I've removed RiTz21's review because giving your own product a five-star review is seriously lame. Still trying to figure out what happened to Mosaic's. The button in the Item Data sheet will now also copy the new item to the Data sheet (in the custom Area) so that this new item will be available for the other sheets as well (specifically, the Group sheet). This will allow the Group sheet to keep a permanent record of custom built items which will not be required to exist in the Treasure! sheet any more. This assumes you have access to Excel macros and have not completely filled the custom area! Increased the width of the Item Name columns in the Group sheet to use the full width on printouts. A typo in all the names of the arcane scrolls! Bought this last night. I love it, makes my game run so much smoother. I can't recommend this or the full version of TOS enough. * The Player's Loot sheet now allows a player named 'GROUP' (or your group's name) to be defined to represent the loot assigned to the group. These are the release notes for version 1.40 of the Loot Divider! Below, you will find all the new things added or fixed from the previous release. If you detect a Bug or any errors, please report it in the BUG REPORT sub-section that you can locate in the Loot Divider sections of The Only Sheet forums! Updated to version 1.41, which fixes the Button in the ItemBuilder worksheet, which was causing an error. Updated to include visual representation of what your character is wearing! Users who use the 32 bits version of Excel will have access to the new Quick Pick feature of this new update! The Quick Pick button, found on the Treasure! worksheet gives you a fast way to select an item, by listing all items alphabetically - or by group! The selected item will either be placed where the cursor currently resides (if in the appropriate column) OR otherwise be appended at the first 'free' slot. Try it out! I created a new video demonstration for the Loot Divider. Many users told me they learned a few new things from it! The space available for items on the Treasure! page was increased from 198 to 500! Hopefully this should help with long campaigns! The ability to add the size in the property string of Weapons was added. Unfortunately, the [Pathfinder] rules just covers Small, Medium and Large weapons (value wise). The rest of the sizes are not covered in the rules. So any weapons tagged as Large or larger (Huge, Gargantuan, Colossal) will have twice the value. Otherwise, Medium or smaller weapons will have the same value as a medium weapon. Thankfully, the rules for armor sizes take into account all available sizes. So in this update, you can now define armor and shields for any sizes. Note that only Humanoid types of armor sizes are processed. i want this so badly! but i live in the netherlands and i dont have a credit card, we don't use those here, why isn't there an ideal option for this?